Sergeant David Christoff, Kilo Company. Haqlaniyah, Iraq. May 2006. Sergeant David R. Christoff was born in Toledo, Ohio, on 22 January 1981. He graduated high school and went to work in the construction field. Following the September 11th attack on U.S. soil, he enlisted in the United States Marine Corps on 26 November 2001. After graduating from Marine Corps Recruit Depot Parris Island on 22 February 2002, he attended the School of Infantry (SOI), Camp Lejeune, North Carolina, and was subsequently assigned with 1st Battalion, 3d Marines, at Marine Corps Base Hawaii. 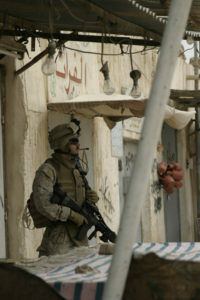 He deployed with 1st Battalion, 3d Marines, to Fallujah, Iraq, in support of Operation IRAQI FREEDOM and participated in Operation PHANTOM FURY in November 2004. He was promoted to the rank of Sergeant on 1 October 2004. Upon returning from Iraq on 15 March 2005, Sergeant Christoff volunteered to transfer to, and deploy with, 3d Battalion, 3d Marines, in order to teach Marines the hard lessons he had learned during his previous deployment. He officially reported to Company K, 3d Battalion, 3d Marines, on 12 September 2005, and became the Platoon Sergeant of 2d Platoon. He served as Platoon Sergeant from 12 September 2005 until 4 January 2006, leading the Marines in 2d Platoon through multiple pre-deployment training exercises including Mojave Viper. Sergeant Christoff deployed with 3d Battalion, 3d Marines, on 11 March 2006, to Haqlaniyah, Iraq, in support of Operation IRAQI FREEDOM and was killed in action on 22 May 2006. Sergeant Christoff attended Helicopter Rope Suspension Training Master Course, Marine Corps Martial Arts Program Green Belt Instructor Course, and Regimental Squad Leader’s Course. His awards include the Purple Heart (2nd Award), the Navy and Marine Corps Commendation Medal with Combat “V” (2nd Award), the Combat Action Ribbon, the Good Conduct Medal, the National Defense Service Medal, the Iraq Campaign Medal and the Sea Service Deployment Ribbon (2nd Award). He is survived by his mother, Amy Hogan, and his father, David Christoff. “One of those who gave his life was Sergeant David Christoff, Jr., of Rossford, Ohio. The day after the attacks of September the 11th, David walked into a recruiting station to become a United States Marine. Asked why he made the decision to serve, David said: “I don’t want my brother and sister to live in fear.” David eventually deployed to Iraq, where he fought street by street in the battle of Fallujah and earned a Purple Heart for wounds suffered in action. “While on leave back home, David learned his company was headed for combat in Afghanistan. But he knew there was also a job to finish in Iraq. So he asked to be reassigned to a unit headed for Iraq, and last May he died in Anbar province where the Marines are taking the fight to al Qaeda. When his family received his belongings, his mother and his father each found a letter from David. He asked that they pray for his fellow Marines and all those still serving overseas. 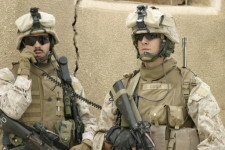 Sergeant David Christoff (L) and Lance Cpl. Connor O’Shea (R), Kilo Company. Haqlaniyah, Iraq. May 10, 2006.